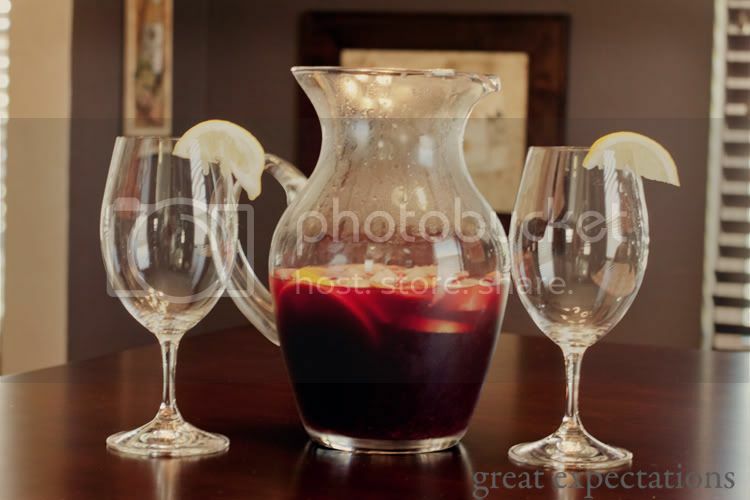 Inspired by this, we decided to whip up a pitcher (or two) of refreshing homemade sangria to enjoy on this hot Sunday afternoon. Not a bad way to end the weekend! In a large pot or bowl, combine the wine, brandy, orange juice, pomegranate juice, and sugar and stir until the sugar dissolves. Squeeze half of the slices of orange, lemon, and lime into the mixture. Add the remaining orange, lemon, and lime slices, and the apples (as full slices to soak in the mixture) and refrigerate until well chilled, about 1 hour. Remove from the refrigerator and add the soda or ginger ale. Serve in glasses (over ice if desired). This sounds absolutely perfect for summer, and especially for Phoenix! Happy to found your blog. I'm now a new follower. Mila from http://hereundertherainbow.blogspot.com.